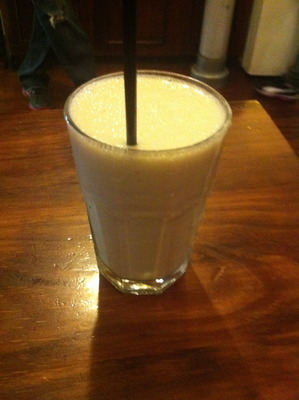 It is not easy to buy and enjoy a quality banana smoothie in Melbourne like it is in Sydney. Sure you can go to any Boost Juice outlet and order a Banana Buzz, however I am talking about a more home made, authentic cafe style smoothie. It might be easier to buy your own blender and make your own the way you want it to. Maybe go for both ways. No doubt, banana smoothies are quite filling, and Melbourne's best (for me) would have to be right near Flinders Lane, near the library on Centre Place. Not necessarily a cheap banana smoothie; this will set you back $8 - needless to say bananas aren't cheap at the moment, however come to Vicolino Caffe relatively hungry (not starving) or a little peckish, and you will enjoy a filling and nutritious banana smoothie. It is thick and well blended with an abundant supply of bananas with an adequate honey taste. Just right. This establishment does not go overboard on the ice cream or the milk which is fantastic. Worth the current price once in a while. On any given weekend, this establishment does get crowded, and thankfully on the occasions I have been here for my banana smoothie fix, I have not had to wait for a table. Great food and great service, this is why.